Wendy was nominated in April 2004 as Country Female Artist of the Year by the prestigious trade magazine Mew Music Weekly based in Los Angeles. She is nominated along with a Who's Who of female artists including Faith Hill, Martina McBride, Reba McEntire, Patty Loveless, Chely Wright and Sherrie Austin. The NMW Awards Show that will honor the nominees and winners will be held on Saturday, June 26th, 2004 at the famous Key Club Theater in Hollywood, CA. Balloting was by DJ's and program directors and other industry professionals, primarily in the medium to smaller radio markets. New Music Weekly is a publication that follows in the tradition of radio pioneer and legend Bill Gavin. Wendy received the news just prior to a trip to Nashville to begin work on her next album. "I feel so honored to be included as a nominee with this group of great singers," Wendy says. "I have worked very hard and these are the kinds of things that make the hard work worthwhile. I'm very happy and excited." Six singles from the Indigo Blue album have been released to radio. All have charted on various indie charts, with four in the Top 10 on several charts. Wendy's next country album is scheduled for release in late 2004. Wendy's latest single, Strong Strong Arms, was #1 on the Inside Country chart and #46 on the New Music Weekly mainstream country chart; it ran on the MNW chart for 5 weeks, holding it's own with the major label releases. Mobile, her previous single, reached the #1 spot on the Inside Country chart and #40 on the NMW chart. Indigo Blue, the title song from her current album, reached #8 on the Inside Country chart and #46 on the NMW chart. These releases and others have run in the Top 20 on several other country charts, and continue to receive widespread airplay. Feedback from radio and the country audience continues to be enthusiastic. Wendy's Country single, Mobile, was added immediately upon release by Country radio and songwriting legend, Bill Mack, to his show on XM Satellite Radio, Channel 171, and to his syndicated radio show on several hundred stations on AM/FM. It was picked for his "OVERDRIVE TOP-TEN COUNTRY COUNTDOWN" in syndication for the week of May 19. Bill says, "I really like this recording. She projects 'originality' with a very exceptional voice." "I asked the listeners to respond. ALL calls referred to the fact it's a great recording by an outstanding singer." This haunting story song about a trucker and his hitchhiker rider continues to receive enthusiastic audience response and is moving steadily up the country charts. Wendy was pleased to be invited to give a concert as the concluding event for the Wimer Memorial Horse Show at the Rosebud County Fairgrounds in her home state of Montana on July 6, 2002. The audience turnout and response for this annual event in Forsyth, MT was excellent in spite of 100 plus degree temperatures. 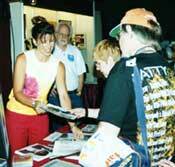 In April 2002, Wendy was in Myrtle Beach, SC to give a concert at the Church of God in Myrtle Beach. This was her first visit to this ocean side tourist town, and she was impressed by the community and her warm reception there. She participated in the St. Mark’s benefit concert, sponsored by St. Mark’s United Church in Valrico, FL in May 2002, as another in a series of concerts and events that Wendy has been a part of over the past year. Wendy's new Christian country single, Seeds, was recently released on the HMG Christian Country Disc, Vol. 50. Her previous single, Harbor Of Your Arms, spent six months on the Power Source Magazine Christian Country chart, reaching No. 6, and got to No. 9 on the CCRB Christian Country chart. Christian Country promotion services are being provided by Daniel Johnson, Johnson Management & Media (615-297-8418). Just Listen and Hang On, the first two singles from Wendy's Indigo Blue album both reached the number one spot on the Inside Country Indie Chart in 2002. These singles also did well on several other charts including a No.18 spot for Hang On on the Indie World Country Chart which tracks international airplay. Wendy's recent single, Indigo Blue, the title cut from her latest album, broke the Top 50 on the New Music Weekly country chart, a major national chart, in April 2003, where it held it's own for three weeks along side the major label releases, and is currently at No. 8 on the Inside Country chart. Wendy was a finalist for Female Artist of the Year at the CCMA Awards Show 2001, held at the Ryman Auditorium, the original home of the Grand Ole Opry in Nashville, on November 1, 2001. The show was hosted by John Berry and country music legend Crystal Gayle, and Wendy was delighted to be a part of this nationally televised program. While in Nashville, Wendy worked on recording several songs for her upcoming country album, Indigo Blue. Wendy was thrilled to be invited to join the talented cast of artists for Sunday Mornin' Country at the Grand Ole Opry on Sunday, June 17. She performed her new country gospel single, Love Lifted Me Away, to an enthusiastic audience; the house band included several musicians that played on her album, Wanted, and this was a fun way to renew some acquaintances. Hosted by the Music City Christian Fellowship, Sunday Mornin' Country has been a long standing tradition at Fan Fair for over twenty five years. The program was graciously hosted by Ernie Rowell, MCCF president, and Fred Bacher of WTVY. This year the cast included well known Opry members, Bill Anderson and Connie Smith, the Babcocks, Freddie Hart, Stu Philips, Kevin Sharp, Rickie Lee Phelps, and many other well known country and country gospel artists, in an inspiring morning of heartfelt gospel music. 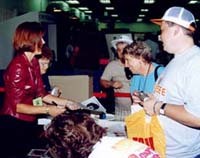 Wendy greeted fans again at Fan Fair on June 15, 2001 in Fan Fair's new location at the Convention Center in downtown Nashville. Fan Fair provided a unique opportunity to announce the release of her new album Wanted. Wendy enjoyed the chance to meet fans from all over the country. She was delighted to sign hundreds of autographs and have her picture taken with dozens of fans, young and not so young. 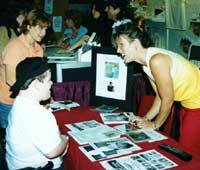 One special moment stands out as she was greeting fans; she was asked by a young handicapped fan, Patrick, if she would sing one of her songs for him. Patrick's mom suggested instead that if she would sing Amazing Grace, Patrick could sing along with her. As Wendy sang the first verse of Amazing Grace, Patrick joined her on a high harmony part, in a spontaneous duet that brought a tear to the eye of everyone nearby. For two or three minutes you could have heard a pin drop; a real goosebump moment that we will all remember. Thanks again to Gary Alms and Music City Christian Fellowship for hosting the booth, to Daniel Johnson, Johnson Management & Media, for all his promotional efforts, and to publicist Chuck Whiting, Whiting Publicity and Promotion for all his help with photos and publicity. 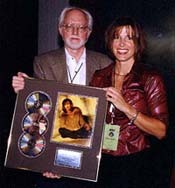 Wendy was a finalist for New Artist of the Year at the CCMA Awards Show 2000, sponsored by the Christian Country Music Assn. and held at the Ryman Auditorium in Nashville on November 2, 2000. She was delighted to follow Collin Raye on the nationally televised program, performing her Christian country hit single, Wanted. The show was hosted by John Berry and Linda Davis and was carried by 14 networks to millions of viewers and by live webcast through Gaylord Entertainment. It included a moving performance by Merle Haggard singing his new gospel single, Cabin In The Hills, along with many other talented Country and Christian Country artists. While in Nashville, Wendy also completed recording the vocals for her new Christian Country album, Wanted. Wendy made her first appearance at Fan Fair in Nashville on Tuesday morning, June 13th, 2000, and was delighted that she could celebrate the success of her first No.1 Country single, Midnight State of Mind, with the fans that were there. The song went to No.1 on the Inside Country Indie Chart in April. She was presented a plaque marking the occasion by her label, White Water Records. Label head, John Nelson, was there to share the occasion along with publicist, Chuck Whiting, of Whiting Publicity and radio promoter, Daniel Johnson, of Johnson Management and Media. The event was hosted by Gary Alms at the Music City Christian Fellowship booth, and a No.1 cake was served to everyone there. Fan response was enthusiastic; Wendy signed several hundred autographs, had her picture taken with numerous fans, and was able to greet and share a smile with fans of all ages. Wendy's single, Midnight State of Mind, from her debut Country album, Ten Below, went to #1 on the 4/28/00 Inside Country Indie Chart. It was released to Country stations on January 21, 2000 and was the highest debut single a week later on the Indie Central Country Indie/Major Top 100 and Country Independent Top 50 charts. The song reached #22 on the Indie Central Top 50 chart and #8 on The Nashville Panel chart. Wendy is excited to be sharing the charts with such legendary country artists as Dolly Parton, Kenny Rogers and Bobby Bare. You can download a free MP3 version of Midnight State of Mind on the Ten Below music page. Songs from Wendy's albums, Indigo Blue and Ten Below, have been receiving regular airplay on CountryBear.com, a fulltime Country webcasting station. CountryBear.com plays an excellent mix of traditional and current County artists and like TwangCast (see below) is committed to providing music for an audience that is hungry for "real" country music. They have received an enthusiastic response and their listener base is growing rapidly. Wendy's single, My Bel Air, was released to European radio stations on the Cabin Creek compilation disc in November, 2000 and received widespread airplay on European country radio including stations in France, England, Belgium, Sweden and The Netherlands. Wendy was at #15 on the list of most played independent Country artists in Europe as of 3/15/01. The song reached #12 on the CIC (Country Independent) chart and #30 on the Indie Central chart in this country. Several songs from Wendy's album, Indigo Blue, were just added to the playlist on TwangCast (www.TwangCast.com), a full time internet radio station that broadcasts traditional country music. TwangCast is dedicated to airing "real country", which includes a blend of old-time artists like Kitty Wells and Jim Reeves, major artists that no longer receive Top 40 airplay, like Dolly Parton and Willie Nelson, and a wide range of independent artists and bands. TwangCast is supported by listener donations and provides full time music programming, uninterrupted by commercials. Wendy's albums are now available worldwide through Amazon.com. We have had many radio listeners and fans searching for Wendy's albums in music stores and Christian bookstores around the country, and fortunately many have found us through our web site or through their local radio station. Having her music available through Amazon.com makes it possible for Country and Christian Music lovers to locate and order her albums quickly and easily. Of course, her music will continue to be available directly from White Water Records also; visit our products page for more information. Wendy's albums are also distributed and marketed by The Orchard, an internet distributor that markets music through major internet retailers like CD Now, CD Universe. Her albums are also available directly from The Orchard, which specializes in music by independent artists. As a result, Wendy's albums are available world wide through most of the established internet music retailers. In February, Wendy was the featured guest on Bridges, a 30 minute weekly program on Channel 39 in Nashville, hosted by Monica Schmelter. The interview ranged from Wendy's background in music and how she got her start in the business to her interest in the importance of music as a ministry. Her Child Of Mine album was featured and a clip from her hit single, Startin' All Over Again, was aired. WSHO, New Orleans, LA: Very refreshing music! WHEM, Eau Claire, WI: Good! WKMT, Kings Mntn. NC: Great talent! WAMV, Amherst, VA: Great Sound!